Pep Guardiola has been warned. 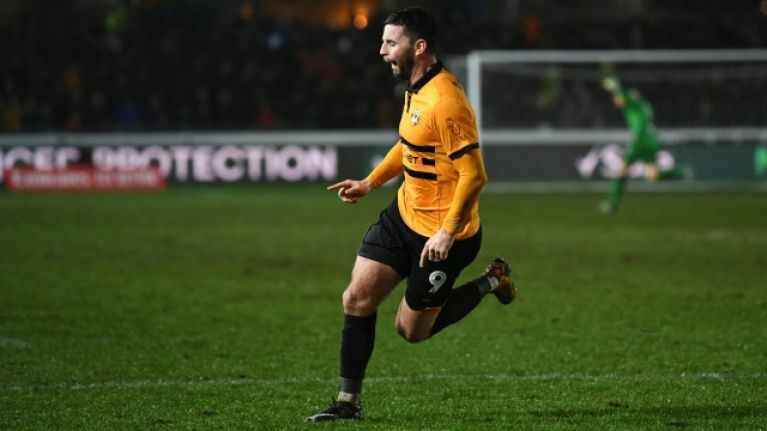 Newport County are playing without fear and deserve their place in the fifth round of the FA Cup. The League Two outfit claimed the scalp of Championship side Middlesbrough in their fourth round replay on Tuesday night, with Carlow man Pádraig Amond playing a starring role for the underdogs. Amond assisted Robbie Willmott for Newport's first at Rodney Parade but he saved one of the most beautifully-worked goals of the competition for 20 minutes later. As Boro's defenders picked up their men in the box from a Newport corner, Amond pulled away to the penalty spot, took another couple of steps towards the edge of the area and let fly. In a move straight from the training ground, the ball bounced twice in the box before it arrived at the right boot of Amond, whose connection couldn't have been more perfect as the ball rocketed beyond 'keeper Dimitrios Konstantopoulos. The celebrations tell you everything you need to know about how much the goal meant to Newport and their fans, who can look forward to hosting one of the best teams in Europe next week as they have been drawn against Manchester City in the fifth round. Amond, previously of Shamrock Rovers and Sligo Rovers, was not the only Irishman to impress as Dubliner Mark O'Brien put in a solid shift at centre-back to leave Boro scoreless and keep the Newport dream alive.